Cobbler Creek is a 2.88 square kilometre (or 712 acres in the old money) nature reserve that is perhaps best known as the expansive natural barrier between the suburbs of Golden Grove and Salisbury. It is a great hiking place with both short and long trails and plenty to discover and see. In summer, Cobbler Creek is a reminder of just how inhospitable the raw Australian outback can be. Cobbler Creek was settled in the early 1800s by William Pedler, a cobbler, and used for a time as farmland. The Porosa Hike will take you on a 5.5km trek along the original farm tracks, to give you an idea of what early settlers did on a daily basis. For those who are interested in our early colonial history, there are a few things to see at Cobbler Creek. First, the Trevalsa Ruin, the remnants of William Pedler's home, is situated at the bottom of the hill accessible from the Grove Way. After a steep walk up the hill, you can also see the Teakles House, a much more substantial ruin of another farmhouse. Teakles sits at one of the highest points in Cobbler Creek, and so to visit Teakles is also to take in some rather fantastic views of the hills to the east and the Adelaide plains and ocean to the west. The reserve itself is split down the middle by the Grove Way. To access one side from the other, the safest way is via the underpass at the base of the hill near Trevalsa. There are opportunities to cross the 80km/h road at other points, though. 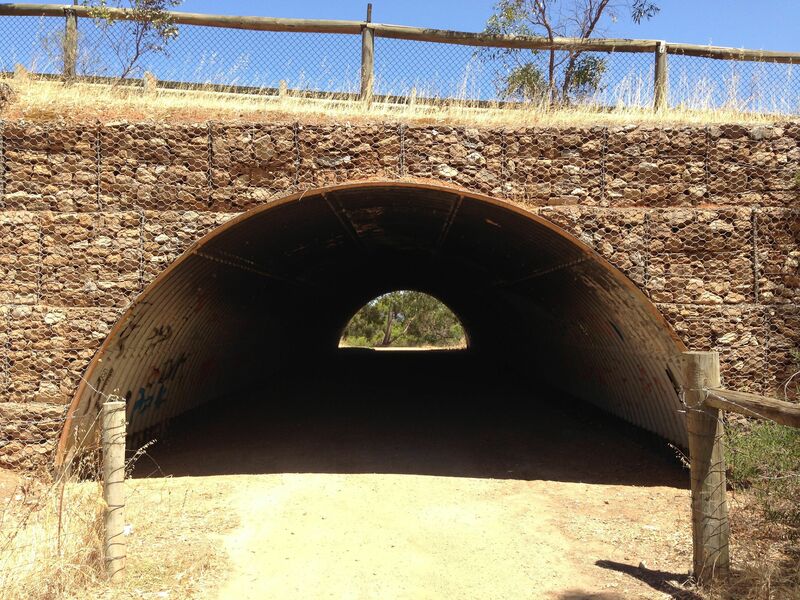 The underpass at Cobbler Creek - also serves as shady respite from the heat! As far as facilities go, Cobbler Creek keeps to the bare minimum. Along the trails you will occasionally come across a bench, which you will be grateful for, but then it's onwards and upwards once again. Because of its stripped back nature, the paths are mostly loose gravel and rocks. Keep this in mind when planning a trip to the Creek. Sturdy and enclosed footwear is an absolute must, and so is a drink bottle. The park is open every day from sunrise to sunset, except on total fire ban days. Because of the historical and natural significance of Cobbler Creek, it is important to leave it as undisturbed as possible. Please make sure that if you bring anything with you on your hike, you take it with you when you leave. All in all, Cobbler Creek is a great place to get back to nature, except instead of it being in the middle of nowhere, it's literally right around the corner from McDonald's. Now that is what I would call having the best of both worlds. Fantastic place for mountain biking! Awesome, I'm going to check out the new MTB trails at Cobblers this afternoon!